Bulletproof, might be a word that one would think of when using one of these, and if not for a couple of minor details great would be another. So if you really like the form factor and can get past the bulk you will most likely love this kettle and maybe even the bowl and cup. I know I do. Gotta say I love my kettle and enjoy a spot of tea in the insulated cup, and the size of the kettle makes it so I can enjoy my tea and hydrate my meal with a single boil of water. If I'm using the bowl for a breakfast of oats or other hot cereal I usually have warm water to clean up the bowl and utensil. I believe the finish and durability to be second to none I've seen, and as a tea drinker I just like the idea of a kettle over my twig stove in the evening after a good walk or beside my hammock in the morning at breakfast. The cup and bowl set are well thought out and implemented. The insulation and locking lid for the cup does everything a nice starbucks mug does, but that starbucks mug isn't going to nest in anything in my pack, and the GSI cup is fairly light. The cup and bowl have measuring marks to boot, so you have dual purpose items. 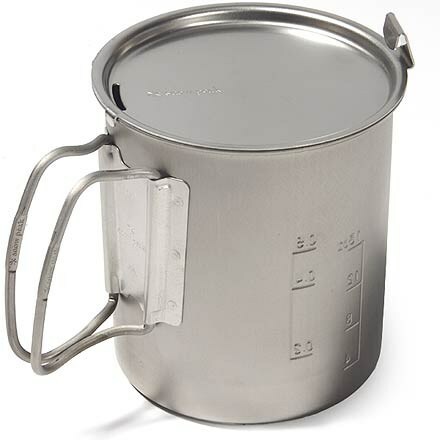 I've boiled water with budlite alcohol rollover and 2 piece jetted alcohol stoves, a TATO Gear AB13 alcohol stove (more on that later), a modified fancy feast stove (my favorite), Jetboil, and a TATO Gear Element twig stove all with good results. Heck, I've even used it on my kitchen gas range just because! I haven't used it over a campfire due to comments that the insulation on the lid and handle do not handle high heat well, but when and if I try I will be using discretion. Do you like fresh baked muffins in the morning? Sure you do, and with the purchase of a titanium bowl and a low heat stove you can absolutely bake in the kettle, and that's the way I pack mine as the titanium bowl is lighter. I've produced great breakfast muffins drybaking with the TATO Gear AB13 and Element stoves. Who wouldn't enjoy reclining in a comfortable hammock with a hot muffin and a cup of tea? Sound like a good idea to you? If so the Ketalist fits the bill. The foon is workable, but I'd rather use a wendy's spoon, I'm biased against sporks. I've used mine on the trail, in campgrounds, rest stops and at lunch if I'm in the mood and working in the field. 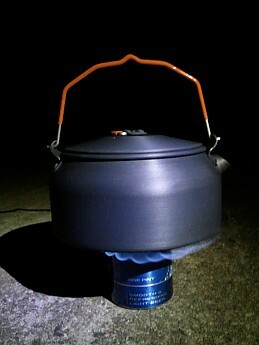 The kettle works well with its wide bottom in all environments if you choose the appropriate stove for the temperature. Backpacking, yeah it works, but its bulk and weight eliminate it from the weight-conscious hiker's pack. Campers and bushcrafters however wouldn't bat an eye at either, but some may since it is not really a cook pot. Overall after two years of moderate use I have to say it was a great purchase for all around use, but as I've acquired lighter gear that is more packable it stays in the gear box for backpacking most times, but I do take it along like an old friend when I plan to spend more time around the fire and less time carrying my pack. 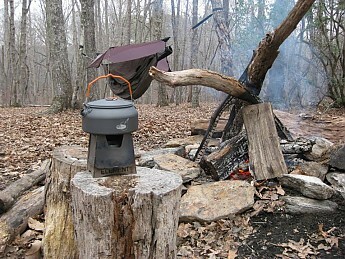 Below is a favorite pic of the kettle on the Element stove when I used the Element as a windscreen. Nice review and pic, Dirtwheels. Thanks for sharing it. Great review.... awesome pic, looks like a magazine ad! If you could, would you mind posting pics of the other contents as well? Ah, the Foon. I have been making fun of that thing for years. You'd think GSI would give up on it and try something else! @ TJ, I will see what I have later this evening and thank-you for the compliment on the pic. @ Goose, agreed, there is surely a better design. 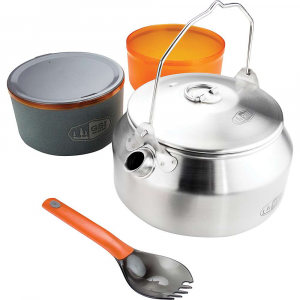 The Ketalist cookset is perfect for freezerbag or freezedried cooking. 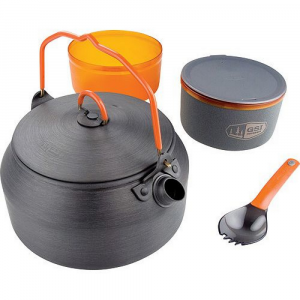 The cookset is a just a tea kettle with a nesting bowl/cup and telescoping spork combo. re- hydrating freeze dried meals a tea kettle is the way to go. The bowl works well as a measuring cup and for eating out of as well, the cup has an insulated removable cozy and a sippy cup lid that snaps firmly into place and works well for shake mixing dehydrated milk or any beverage of choice. The lid on the kettle sits loosely on top so you do need to hold it in place while pouring, some people take issue with this but it really was no big deal for me. I cannot comment on the spork because I didn't take it. Any tea kettle simplifies pouring scalding water into a container versus a pot but the ergonomics of the handle and pot kept the heat away from my hands and was much appreciated. This set packs easily in the outer pockets of my pack and will probably become my cookset of choice when I need a lightweight kit. Excellent product. I use this cookset year round. This product is vary resilient and stands up to heavy use. My only complaint is the spork. They are easily broken and I now use a titanium spork. It's not a "spork." It's a "Foon," and I've been making fun of them for years! Welcome to Trailspace, Trevor. This is a great set for what it is, but needs a pan that nests under the kettle and then it would be perfect. This kettle can boil a quart of water in 2>3 min on an MSR PocketRocket. The small fuel can nests inside the kettle inside the bowls. If it were a little bigger (enough to fit a larger fuel can) and had a nesting fry pan this would be some of the best improvements GSI could make. That being said, for the money, the weight and options this kit can and is being used for on my adventures is well worth it. The coating is tough to scratch and hard to dirty; cleaning is easy. The carry sack is a little on the skimpy side and the foon is practical, but laughable, ranking a step up above a plastic spork and below the Kung Foon. A long ti spoon or ti spork is better since if you're using this kit most likely to heat up water for rehydration of bagged trail meals or instant meals and not cooking in the kettle although you can if you must. This is where an extra pan would be best, since cooking with a narrow opening is a bit tricky and you would need something longer than the foon to stir and scrape the hot food out of the kettle. Now if GSI can figure out how to nest a pan to the kettle or could make one of the bowls out of the same material as the kettle or both this would be a satisfactory solution and a near perfect kit for my needs on the trail. I gave it 4 and a half stars. This is a good kit and is what it is, a little more features and this could be the best kit on the market for the solo UL/SUL (ultra-light/sub-ultra-light) hiker/ camper. Welcome to Trailspace, Benjamin. Thanks for the review. Welcome to Trailspace, Benjamin. Thanks for your sharing your cookset review with us. Your review prompted me to go check out the Kung Foon in comparison. I hope you'll keep us posted on how well your gear works. 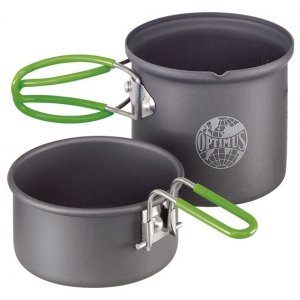 I really like this set for use with a stove. I use an MSR PocketRocket with it. Water boils quite fast in it. It will boil enough to rehydrate a Mountain House meal and leave water left for coffee or tea. I like the nesting blow and cup set. There is a nice neoprene sleeve around the cup that keeps your beverage warm longer. The only drawbacks are the fact that you cannot use this over open flame due to the plastic coating on the handles, and the "foon". The collapsible spork is really flimsy. I replaced mine with a Titanium spork. I liked this set so much I bought the stainless steel version of the kettle for use over open fire. I do recommend this product highly if you cook on a stove. If you mainly cook over fire get the stainless version of this set. You can do more than boil water in this pot. Read in another review that you can cook in it and wanted to be sure before I took it on the trail for that purpose. 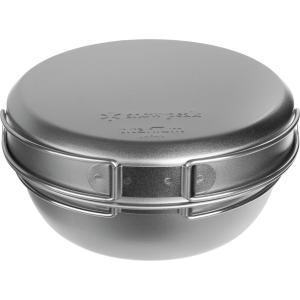 Because it has a very wide lid you can actually cook in this pot. I made one of my favorite meals, Fettuccini with Salmon. I used the Lipton Knorr Pasta Sides Alfredo and a foil packet of Smoked Salmon purchased from the grocery store. The recipe calls for 2 cups of water and the total contents just fit into the pot. I cooked it over a Trangia mounted in a MoJo stove stand and also used a wind screen. The recipe calls for bringing the water to a boil and then continue simmering after the noodles and salmon are added for about 7-8 minutes. The Trangia simmer ring allows for a nice simmer. Be sure to leave the pot lid off and stir occasionally. It worked just fine although it would have been easier to cook this in a straight sided pot, but for a very light cooking set up, the Trangia, MoJo stand, and GSI pot makes a great combination as the stove fits inside of the included cup and bowl set which fit inside of the pot. It makes a very compact set. The MoJo stand and wind screen fold completely flat for ease in packing. Yes, it works best for heating water but can also be used for cooking. Great kettle, light kit, not really a cookset unless you just need water boiled to rehydrate something. 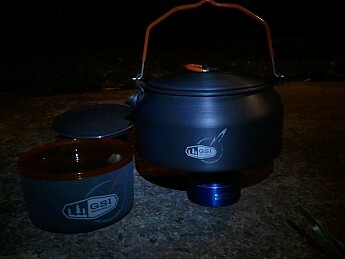 Not much of a "cookset"
The GSI Ketalist works well as its core purpose: a kettle. The bowls are not remarkable but do their job as you would expect a bowl to. The collapsible spoon that in included did not impress me much. I found that food tended to collect where the handle and bowl joined. Not really a big deal for me as I already had a spoon that worked well for me, but something to note nonetheless. Now, the kettle is great. I have used it for about a year now and have not been gentle with it. It transfers heat well, whether from a fire or stove. One thing to note about using it over a fire: the plastic coating melts. If you intend to use it primarily on a fire, I would recommend burning or scraping the plastic off first. Best kettle for the money. Good capacity and accessories. Took this on a 2-day hike to try it out, and it was very handy. I just set it on a campfire and had hot water in minutes. You could even cook in this in a pinch. Comes with a bowl, a cup with heat sleeve and a telescoping spork. These all nest inside with room for an alcohol popcan stove. I have the halulite set and this gives me an extra set of bowls. I have seen complaints about the sporks breaking, but I really like them. 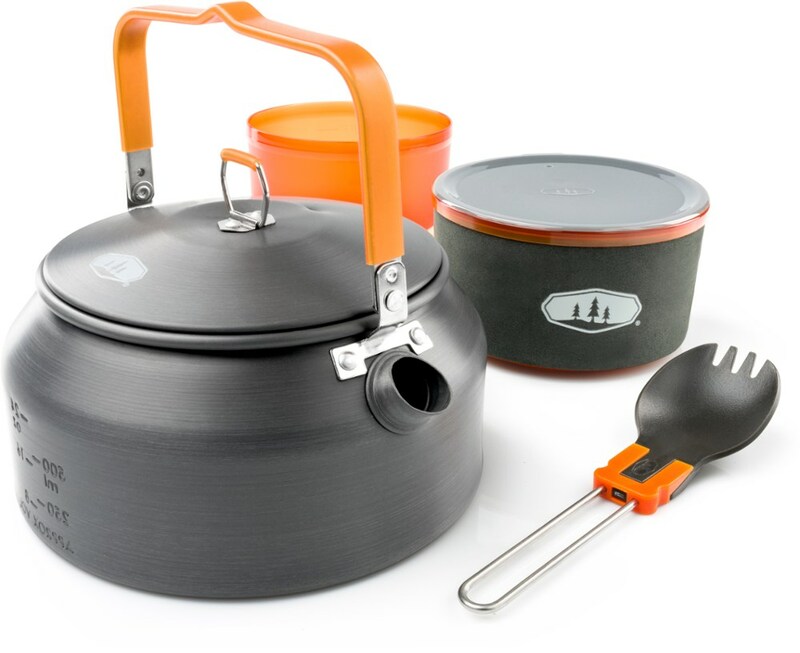 Great little cookset for those who are NOT backwoods gourmets. I only cook freeze-dried meals when hiking and backpacking. The Ketalist is perfect for me as a solo hiker then. Packs small, heats water quickly. 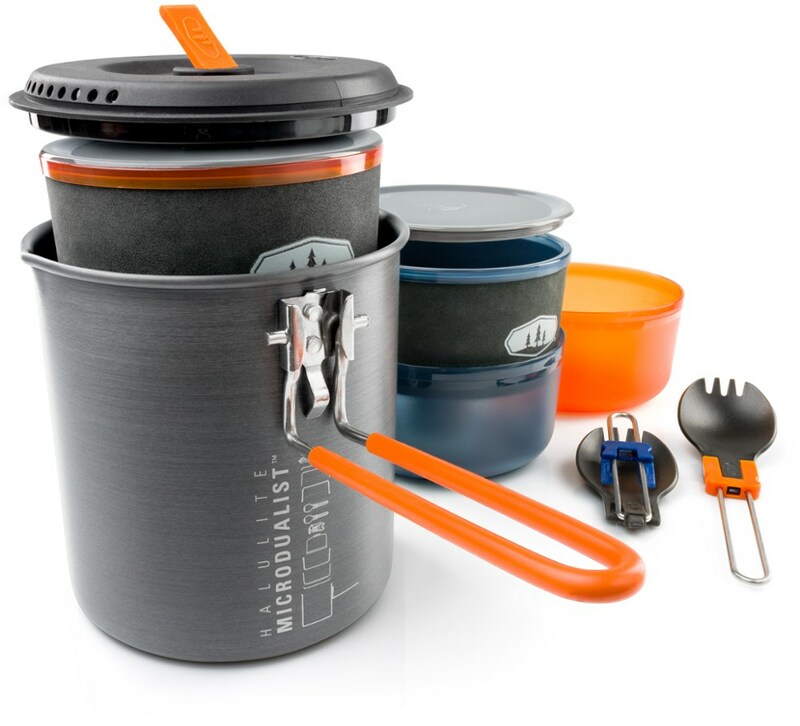 the handle that reaches over the top and the pour-spout are perfect for someone, like me, who simply and only heats water for tea and freeze-dried meals. if you're expecting more, you haven't done your research. The nesting cups are pretty basic; i tend not to use them, often don't even pack them. and the included extendable spork is flimsy, small, and unreliable. the kettle is the only reason i bought this, and i couldn't be happier with it. I bought one for my house it is so fine.